Discussions about email organization are rife where I work. Today someone told me that they take their top 20 items, move them into a temporary folder, move everything else into an archive, and then put the twenty important emails back. Although they were concerned that by the time they were putting the twenty items back, the box was already on its way to being cluttered again. I use flags, although I have a soft rule that if I read something with a flag, it has to go away, otherwise it's just taking up my time. Otherwise, I keep my box incredibly clean because it interrupts my thinking. I have been known to move things to a list in my inbox when it gets particularly messy, but almost always, that's more for brain organization, and I just dump the list into the archive a week later. And for a while, I was receiving a lot of status messages, so I wrote an Outlook addin to parse them and move the most important content out of the email and into the subject line. I know people who print their most important items. But then you have clutters of paper to contend with. And I know people who send their most important items to another account. In the end, to each their own if it keeps them efficient. Title: I wrote an app to send myself mail when my inbox gets too low. 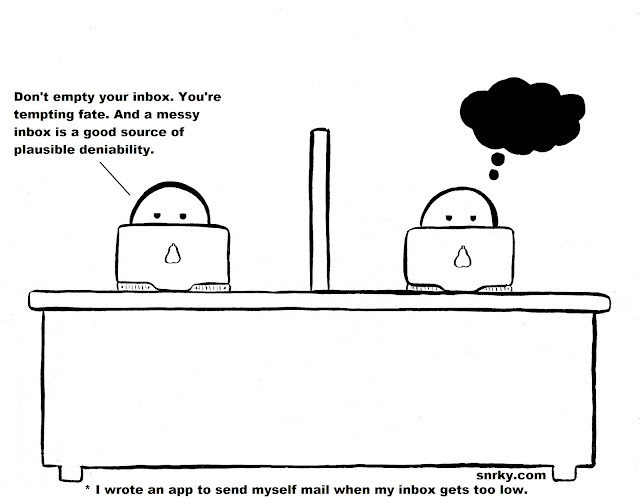 Snarky: Don't empty your inbox. You're tempting fate. And a messy inbox is a good source of plausible deniability.